Media and financial community attention (see links below) were directed to the recent introduction of the ROBO-STOX® Global Robotics and Automation UCITS Index. Kuka GmbH provided one of their new lightweight iiwa one-armed robots to perform the countdown to the opening of markets at the London Stock Exchanged on Monday, November 27th. To provide diversified access to the robotics and automation investment theme in Europe, ROBO-STOX® developed an index that’s specifically catered for investment opportunities that are compliant with the European UCITS requirements. 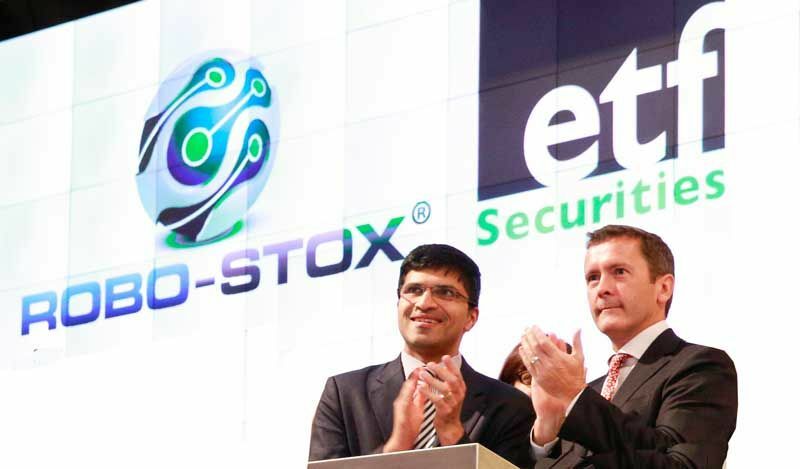 ETF Securities is the first to license the ROBO-STOX® Global Robotics and Automation UCITS Index for use in an exchange traded fund (ETF) that is listed on the London Stock Exchange. The ROBO-STOX® Global Robotics and Automation UCITS Index comprises 82 constituent companies involved in the global robotics and automation industry, spanning the world’s major regions. The index covers a range of key segments, currently with a 47% allocation to industrials, 33% information technology, 11% healthcare, 5% energy and 4% in consumer discretionary. The historical performance of the index has appreciated four-fold, achieving an annualized rate of return of over 16% over the past 10 years, substantially outperforming most major equity, tech and other asset class benchmarks over the same period. For investors, the growth prospects of the robotics and automation sector are compelling. However, neither the traditional Global Industry Classification Standard (GICS) nor the Industry Classification Benchmark (ICB), each of which attempts to standardise the world’s industry classifications, recognises “robotics” and/or “automation” as an official sector classification. By creating the ROBO-STOX® Industry Classification, that gap in the market has been filled and investors and other interested parties can now better acquaint themselves with the corporate landscape of the robotics and automation industry. To capture the full economic value of the robotics and automation industry, the ROBO-STOX® Industry Classification has identified companies all along the production value chain. This ranges, for example, from companies that physically manufacture robots and automation machinery, to companies specialising in the types of software and technology that enable automation. This approach allows the ROBO-STOX® Industry Classification to truly capture today’s and tomorrow’s “makers” within the robotics and automation industry. The index constituents are selected from the ROBO-STOX® Industry Classification by reference to a series of filters including the requirement that they be listed on a recognised global stock exchange and satisfy minimum criteria relating to market capitalization and average daily value traded. Within the Index, a two-tiered, equal weighting approach captures robotic ‘pure plays’ (so called “bellwethers”, currently 40% of the Index) and stocks with robotic segments (“non-bellwethers”, currently 60% of the Index). This “smart beta” configuration allows each constituent company to meaningfully contribute to the index’s performance (rather than allow it to be influenced by a company’s market capitalisation). The constituents are reviewed and rebalanced on a quarterly basis.